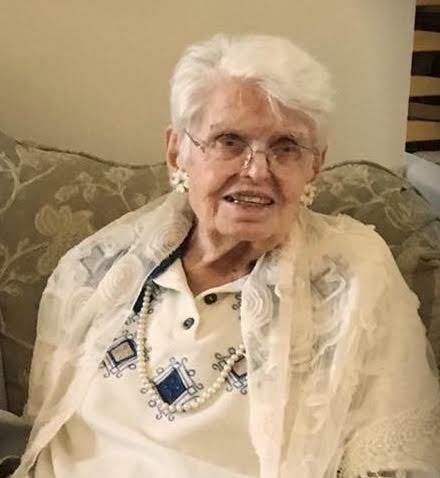 Mrs. Helene J. Schmitt, 92, a resident of Fairhope, AL, died Saturday, January 19, 2019. Helene (Mom) was raised in Falls Church, Va. and Washington DC along with her sister Jackie. Her dad was a successful attorney, and her mother a popular radio singer, but Mom left the big city for the woods of southern Connecticut when she married her husband, Austin a few years after WWII. Mom settled down in a home built by Austin and his brothers and raised a family of four children there in Connecticut. Mom was a writer and always had a story to tell of adventures from her journalism days with the Danbury News Times in Danbury, Ct. Two of her favorite articles told of meeting Ronald Reagan in an elevator at the Republican National convention, as well as covering from a rooftop a Newtown shootout of rival motorcycle gangs. Her faith and family, though, were at the center of her life. From her love of her daughter Suzanne’s music (she was a faithful attendee of many nightclub performances!) to Christmases spent with her children & their spouses and grandchildren, mom loved her family beyond measure most of all. She was strong-willed and determined in upholding her Christian values; kind and compassionate and loving and loyal almost to a fault. We, her family, are thankful for the memories and the lessons she conveyed to each of us: to never give up hope; to fully rely on God for everything, to love without ceasing; and to find the strength to live the next moment to the best of our abilities. We will miss her dearly, but the impact she made will forever be etched in our hearts. She is predeceased by her husband of forty years, Austin l. Schmitt, Sr., her parents, Ross & Germaine Johnson and son in law, Carey Bryant. Left to cherish her memory are her children, John Schmitt & spouse, Barbara of The Plains, VA, Austin Schmitt, Jr. & spouse, Patty of Fairfax Station, VA, Marianne Bryant of Dunnellon, FL and Suzanne Schmitt of Fairhope, AL. Also surviving are twelve beloved grandchildren, Sarah Schmitt & spouse, Shawn, Anne Schmitt, Elizabeth Mitchel & spouse, Christian, Christopher Schmitt, Margaret Schmitt, Karen Samson & spouse, Anthony, Austin Schmitt III, Clare Schmitt, Charlie Bryant & spouse, July , Holly Treece & spouse, Kyle, Cara Whitaker & spouse, Donnie and Caity Bryant; six great grandchildren, Angela Mitchell, Natalie Mitchell, Max Mitchell, Lily Treece, Cecil Treece, Emma Treece; her only sister, Jacqueline Copp and a beloved niece, Carole Wright. A memorial service is planned at date to be determined at the gravesite of Helene’s husband Austin Schmitt Sr., in Inverness, FL. In lieu of flowers, cards and remembrances can be sent to her family in care of: Suzanne Schmitt, PO Box 173, Montrose, AL, 36559. Expressions of condolence may also be made at www.hughesfh.com. Arrangements are by Hughes Funeral Home & Crematory of Daphne, AL.